The 2013 PIHex (Property Investment & Home Expo) grand prize Buy and Win contest winner was announced today at an exclusive prize giving ceremony. Property buyers who made purchases above RM100,000 at the Kota Kinabalu, Sandakan and Tawau edition of the Expo were entitled to a lucky draw ticket. Property Market to Boom in Lahad Datu, Lahad Datu has slowly recovered and security continues to be tight after the incursion of Sulu militants at Kampung Tanduo in February this year. During the height of the conflict, the roads were empty and business cease to operate after 3:00pm. And the government established the Eastern Sabah Security Command (ESSCOM) headquarter in Lahad Datu, further enhancing the security. Lahad Datu has slowly recovered and security continues to be tight after the incursion of Sulu militants at Kampung Tanduo in February this year. During the height of the conflict, the roads were empty and business cease to operate after 3:00pm. And the government established the Eastern Sabah Security Command (ESSCOM) headquarter in Lahad Datu, further enhancing the security. Despite its dark chapter, it is currently one of the fastest developing areas in Sabah. Plans to turn the district into an economic powerhouse are continuing and Lahad Datu is also gearing up to become a municipality by 2015, following in the footsteps of its neighbours Sandakan and Tawau. The robust economic development in Lahad Datu has opened up more employment opportunities and positive signs can already be seen: the revenue collection last year was RM21 million, surpassing the RM20 million thresholds, and up to May this year, Lahad Datu’s revenue has reached RM12 million. The growth of the oil palm industry has been the key to the rapid growth in consumer power experienced in Lahad Datu in the recent years. The oil palm plantations support many small holders whose financial wellbeing enables them to venture into other businesses. Larger plantations belonging to major oil palm companies support oil palm mills and refineries that employ thousands of workers from labourers to top executives. The many oil palm and tourism-driven investments coming into Lahad Datu will gradually attract supporting services and entertainment industries. With the elevation, the municipality will provide more funds to build amenities and improve services. The district now boasts 30 hotels, with about 800 rooms and there are also 2,937 shops and houses under construction with 766 more units pending approval. Construction work in progress is valued at more than RM1 billion in the district. Currently Big House is handling a 58-acre development of commercial shops and First Palm City Centre in Lahad Datu town centre. The project consists of two and three storey shops, a shoplex, Giant hypermarket, a bus and taxi terminal, plus. According to Liew, the current scenario augurs well for Lahad Datu, as the township is on its way to achieving municipality status. As a result of the above developments in Lahad Datu which were initiated by the government and private sector, the township is poised for growth in the long term. Renowned property exhibition organizer Maxx Media (S) is bringing over its flagship exhibition, Property Hunter Expo to Lahad Datu. This event will be the first partnership between the Sabah Housing and Real Estate Developers Association (SHAREDA). Both parties see a promising demand in Lahad Datu and believe that the event will benefit the locals by presenting various property investment opportunities at their doorstep. The SHAREDA Property Hunter Expo will be held from 29 November 2013 to 1 December 2013 (10:00am to 8:00pm at Dewan Sri Perdana. Public admission is free. 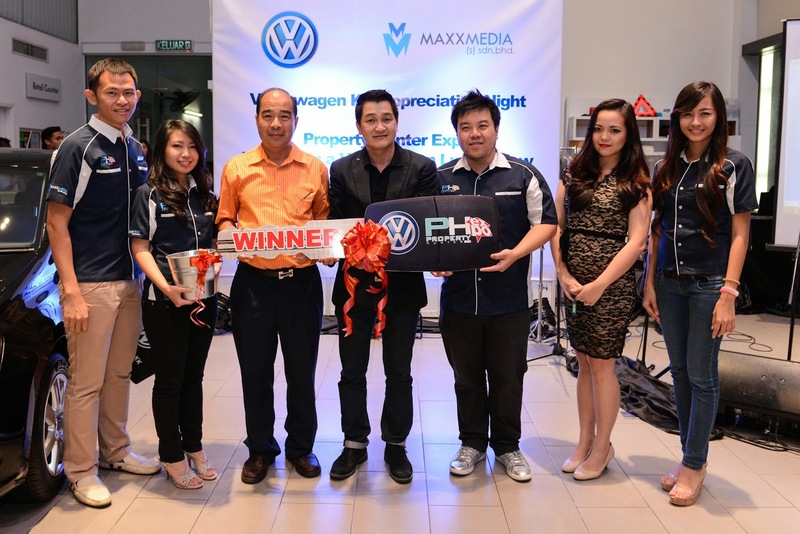 Winner of a Brand New Volkswagen Polo Sedan Announced! Kota Kinabalu, 9 November 2013 – The 2013 PIHex (Property Investment & Home Expo) grand prize Buy and Win contest winner was announced today at an exclusive prize giving ceremony. Property buyers who made purchases above RM100,000 at the Kota Kinabalu, Sandakan and Tawau edition of the Expo were entitled to a lucky draw ticket. Out of more than 100 hopeful buyers, Chum Keat Leong from Sandakan walked away with a brand new Volkswagen Polo Sedan. The Volkswagen Polo Sedan is a reliable German engineered car that showcases its safety features such as electronic stability, anti-slip regulator, and anti-lock brakes. The economical 1.2 litre Polo dishes out its 175 Nm of torque from as low as 1,550 rpm. The TSI engine is also paired with a seven- speed DSG that ensures quick shifts to the right ratio all the time making overtaking in city traffic a breeze while saving fuel. The 2013 PIHex (Property Investment & Home Expo) held in Kota Kinabalu, Sandakan and Tawau which respectively sold RM90 million, RM40 million and RM79 million worth of properties, the event was rebranded as the PH Expo (Property Hunter Expo). The next PH Expo which will be held in Lahad Datu on 29 November to 1 December at Dewan Sri Perdana will be jointly organized with the Sabah Housing and Real Estate Developers Association (SHAREDA). The PH Expo is a Business-to-Consumer (B2C) event that aims to bring investors and home buyers to property developers with the ever growing demand in premium property. It will highlight developers and projects for investors and buyers in Kota Kinabalu, and other parts of Sabah as well.